Ha. Moderation is a weird word to me. The college I went to had this very strange ritual for declaring your major that was referred to as “moderation.” It was a huge deal to moderate. This weird ritual involved a major work in your chosen field (well, not so major. It was like a ten to fifteen page paper. I had to make a five minute dance. It was about rain.) Then you present it to a board of professors who decide if you are allowed to have that major. Most people successfully moderated, and then got to celebrate their initiation into the “upper college.” It was a weird thing. Anyway, moving on, since this post isn’t about that kind of moderation. I’ve been thinking lately about extremes and not extremes and how I tend away from extremes. But first I tend toward them. As my twin sister loves to endlessly joke about, I have habit of making these grand proclamations about myself, these huge announcements of things I’ve realized about myself, only to find that she and Gent already know everything about it. I make these choices to change my life (a la Lifestyle Changes) and then most of the time these huge decisions temper themselves with time and I am left with a much more moderate change. Take that Lifestyle Changes post I just linked to. In that post, I talked about how I’d changed my diet and I was eating more whole grains and veggies and how I felt so much better never eating crap food and I was going to have the best diet. Well, it’s been nine months since that post, and while I do still eat a lot more whole grains, I also really like milkshakes. They’re my favorite. And pepperoni pizza. I honestly got a little bored of that diet once summer came. I’m getting back to it a little more now that it’s spring, but I think I now have a more moderate diet, and one that I’ve got a much better chance of following long-term. Mostly healthy whole foods, but with some junk thrown in for the sheer joy of flavor. The one that’s a bit harder for me is the hair and the skirts. A year and a half ago, while I was unemployed, Freyja asked me to do something pretty with my hair every day. She wanted me to have a little joy in my life, to keep me from getting sloppy when there was nothing for me to get dressed for. And then I decided that she meant that I should grow my hair out super long because the longer my hair, the more devoted I was. Same with the skirts. A revelation that I could still wear skirts in the winter turned into this huge anti-pants proclamation that I would never wear pants again. So I think I’m going to scale back get back to the real, original idea, which was to make me feel better about myself. 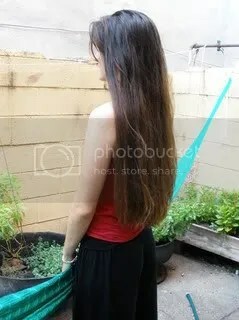 I’m going to get some of my hair cut off–not a lot of length, perhaps, but at least to get some layers so that it has some shape. And maybe I’ll wear jeans to the warehouse, I don’t know. So moderation. It’s a good thing. As much as I love establishing my own traditions, doing the same things too many times can lead to redundancy or rote repetition. It becomes something you do just because it’s something you do and is no longer felt from the heart. I want to live my faith in joy and spontaneity, to listen to the calls of the goddesses and the trees and my body and the history singing in my bones, not live my faith as a skirt I put on just because I do. I want to feel beautiful worshiping a goddess of beauty, not to feel frumpy following the rules I pretend she has set forth to me. I appreciate moderation. I (and a lot of other people, too) often say “everything in moderation, even moderation in moderation.” But I have forgotten that lesson in the last year. So if wearing skirts makes me feel feminine, maybe I should only wear them when I feel the call of my femininity, or at least when it matters to me that I do. These rituals of the everyday can lose their power simply because of their everydayness. So I would like to do them in moderation. So here you go: yet another grand proclamation of myself to myself. Moderation. And listening to what the gods want instead of putting my own words in their mouths, and making things harder for myself than they have asked.